Pyeongchang 2018 Olympics - How good are Canadian, American hockey teams compared to NHL? How would Canadian, American Olympic teams fare in the NHL? For the first time since professional hockey players were permitted to compete in the Olympics in 1998, those under contract to the NHL will not be participating. With rosters composed of former NHLers, prominent amateurs and those competing in other professional leagues, how do Team Canada and Team USA compare to a typical NHL team? Since the majority of the players on these two teams previously played in the NHL, their career data can be used as a starting point to establish how each player might be used, to identify each team's strengths and weaknesses, and to get an overall idea of what to expect when the tournament begins. If Team Canada competed in the NHL, then its greatest issue would unquestionably be on the blue line. The following player-usage chart was based on each player's career NHL data during the past decade. Granted, that information is up to five years out of date for players such as Gilbert Brule, Marc-Andre Gragnani and Wojtek Wolski, but it still serves as a reasonable starting point. First of all, four of the team's eight defensemen have played fewer than 20 NHL games and can't be placed on the chart at all. That includes Chris Lee, Chay Genoway and Mat Robinson of the KHL, and Maxim Noreau from the top Swiss league. Even if these four defensemen had seen significant NHL action, they probably would have been used much like Karl Stollery, Gragnani and Stefan Elliott, who were carefully sheltered in offensive-minded roles against the depth lines on the bottom-right side of the chart. That leaves Cody Goloubef to handle the tough minutes, and even he was below average in quality of competition (the vertical axis) throughout his NHL career. Given that even Goloubef averaged less than one minute per game killing penalties in the NHL, Team Canada's defensive issues could extend to shorthanded situations, too. Up front, they have Chris Kelly and Maxim Lapierre among established penalty-killing forwards, but that's it. Offensively, the team has plenty of experience with the man advantage throughout its lineup, with the primary reliance up front likely to fall on the team's leading NHL scorer, Derek Roy. 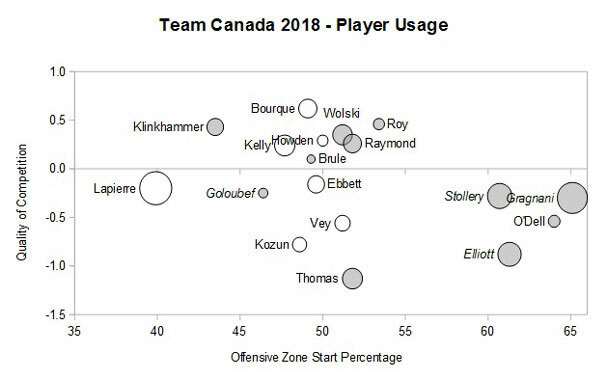 Based on the chart, Roy could center the top scoring line at even strength, probably with Brule on one wing, and then either Wolski or Mason Raymond on the other. The next two centers on the depth chart are Maxim Lapierre and Chris Kelly, but they're both more suitable for the checking lines and could form a single, nifty one if they played together with Rob Klinkhammer. That means someone like Linden Vey, who currently ranks fourth in KHL scoring, or Andrew Ebbett, who ranks sixth in the top Swiss league, would play up in the top six with Rene Bourque, and whoever was left off the top line. In nets, Team Canada appears to have NHL-caliber goaltending, but at the most minimum level. The team's No. 1 goalie will likely be Ben Scrivens, the only one who has played that role in the NHL and who leads the three options with a career save percentage of .905. Of all NHL goalies to play at least 50 games since 2009-10, only Alex Auld has a lower save percentage than Canada's backups, Justin Peters, .900, and Kevin Poulin, .899. It is a harder to assess the American team, because almost half of its roster never competed in the NHL. That includes all three of its goalies, and four U.S. college amateurs, Ryan Donato, Jordan Greenway, Troy Terry and Will Borgen. 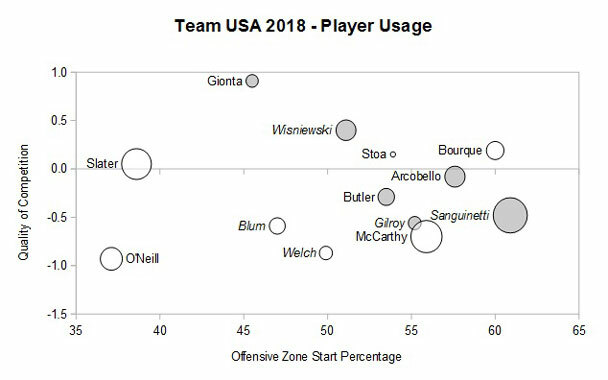 It is clear from the following player-usage chart, however, that Team USA's key asset is Brian Gionta, who has strong shot-based metrics despite taking on top opponents in both zones. He's a versatile two-player who can be employed in whatever role suits the team best, but given the team's lack of strong defensive players, Gionta will likely be employed on the top shutdown line, with Jim Slater at center and John McCarthy on the wing. That could leave Mark Arcobello to center the top scoring line, likely with prolific AHL scorer Chris Bourque and Bobby Butler. However, there are plenty of other intriguing options, such as 6-foot-5 power forward prospect Jordan Greenway, Chad Kolarik, who ranks fourth in scoring in the top German league, and Garrett Roe, who ranks fourth in scoring in the Swiss league -- two points ahead of Arcobello. Based on the player usage chart, it appears that the blue line would be built around James Wisniewski, who is positioned similarly to Gionta above the horizon, and with the shaded circle that denotes good shot-based metrics. However, Wisniewski has struggled with knee injuries for several years and can likely no longer serve as the effective two-way, top-four defenseman that he once was. If so, then Bobby Sanguinetti and Matt Gilroy are most likely to form the top offensive-minded pair, while Jonathon Blum and Noah Welch form the key defensive unit. In nets, Team USA has three goalies who are listed at 6 feet tall or under and who are without any experience in the NHL. However, Ryan Zapolski is doing very well in the KHL and was previously effective in both Finland and the ECHL. Brandon Maxwell is among the best goalies in the top Czech league, and David Leggio has had a couple of strong seasons in the AHL and the top German league throughout his career. Given the solid offense, questionable defense and the adequate goaltending, how do these teams stack up overall, relative to the NHL standard? That can be estimated using a catch-all statistic like Goals Versus Threshold (GVT), which measures each player's contributions in terms of goals scored and/or prevented. American Stoppers: Can USA goalies go from anonymity to Olympic glory? Given that several of the involved players never competed in the NHL, there is some question about whether this metric is applicable. However, it is calculated relative to a replacement-level player, which is loosely defined as the best available player outside the NHL, and that is exactly how most of these players can be described. Adding up each player's average GVT per game in the NHL, Team Canada's roster combines for a total of 78.9 goals scored or prevented over an 82-game season, relative to a team of replacement-level players. Since almost the entire roster is in their 30s, their performance may have declined since their days in the NHL, and this estimate should be considered an absolute best-case scenario. Since NHL playoff teams have a combined GVT of at least 120, that would place this team well outside a postseason position and potentially in the mix for the draft lottery. As for Team USA, its combined total is 15.3, which is not on par with any NHL team in the salary-cap era. Better comparison points would be a strong AHL team, or a struggling NHL team from the 1980s, like the Hartford Whalers, or the Pittsburgh Penguins prior to drafting Mario Lemieux.